The very fact you’re reading this means you’re a pet person. In fact, your pet is probably one of the best parts about coming home. And definitely part of the family. With that in mind, there are a number of ways to consider their needs in the place you all live. Hard surfaces are the obvious choice for pet owners. Hardwood and natural stone are each good choices, though each has drawbacks. Wood has a high potential for water damage/staining and even the hardest varieties are prone to scratching under big dog paws. Some softer, more porous stones, have the same issues as hardwood floors, though proper sealing and maintenance certainly extends their lifetimes. Granite, being the hardest of the natural stones, is a great choice for dog owners. Likewise, ceramic tile is one of the easiest floors for a pet owner to maintain. While not usually a first thought when it comes to making a space more pet friendly, animals are very similar to children in their ability to make a mess of your walls. For this reason alone, we have to recommend paint for pet owners. Satin or semi-gloss finishes are great options for high traffic areas, especially ones that see a lot of moisture. An eggshell finish cleans easily but is better in an area with a more moderate traffic rate. If you just have to have a more matte look, make sure to get a washable flat paint. Having a designated feeding station helps create the routine your pet craves. And having it built in means you’ll never trip over, or step in, an ugly dog bowl again. This drawer-style keeps bowls hidden when not in use. This is a great choice for anyone who also has young children, as they always seem to go for the pet food. The slide-in food storage containers placed next to the bowls is a smart touch. If you have the space, a dog bathing station can make your life a lot easier. And, if placed in a garage or other entry space, can help stop dirt from even entering your home. Animals like having their own spaces as much as we do. A fun addition to any space, a built-in kennel gives your dog somewhere to relax without having to worry about getting stepped on or tripped over. And there are so many ways to do this, the possibilities are endless! Prestige Marble & Granite is happy to answer any questions you may have about creating a pet friendly space in your home. We are here to help you with a vast selection of unique, exotic and rare natural stones from around the world. Our knowledgeable staff will guide you through selection, layout, design and installation. We welcome homeowners, designers, and contractors to browse our showroom any time! The “New” Laundry Room Now has Kitchen and Bath Status! 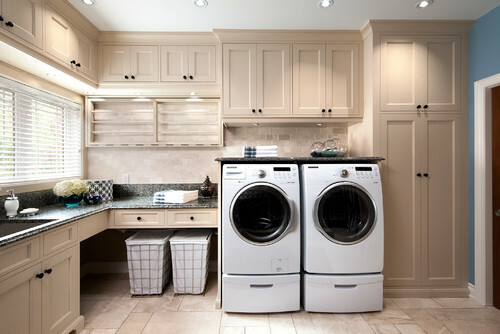 Laundry rooms may be hardworking, but that doesn’t mean they have to be void of style. The once lowly utility room has been elevated to kitchen or bath status; many are downright beautiful, and some are even quite luxurious. 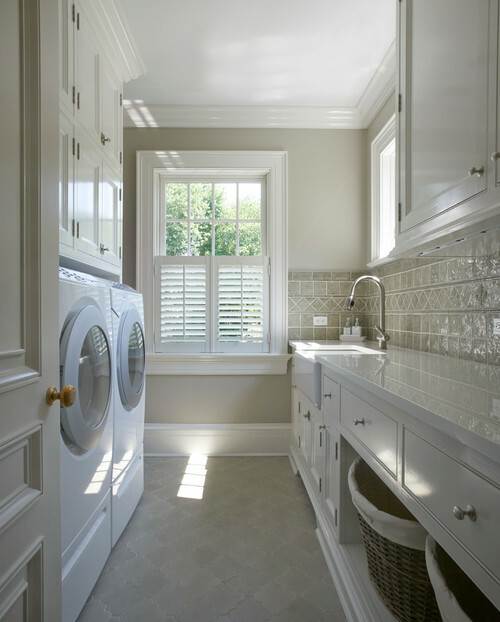 Modern laundry rooms are often multi-purpose, incorporating areas for other tasks such as work, crafts, and even dog-washing. Here are some eye-catching rooms, both large and small, that prove that the home’s most common multifunctional space can be both beautiful and efficient. Pastel colors, bead board, farmhouse sink and natural stone countertops give this beautiful laundry room a coastal vibe. And we love those pull-down drying racks! Photo by Rabaut Design Associates, Inc. Floor to ceiling cabinets with moldings and plenty of drawers give this laundry a sophisticated feel; but the cheerful blue hue keeps it from being to serious. 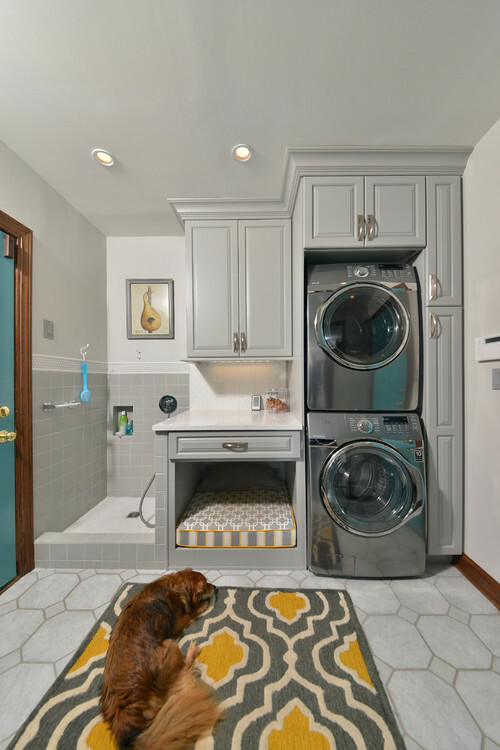 What better place for your dog wash than the laundry room! May as well have a dog bed in there, too. The to-the-ceiling cabinets in on-trend gray are classically beautiful, with the bright turquoise door adding a touch of whimsey. 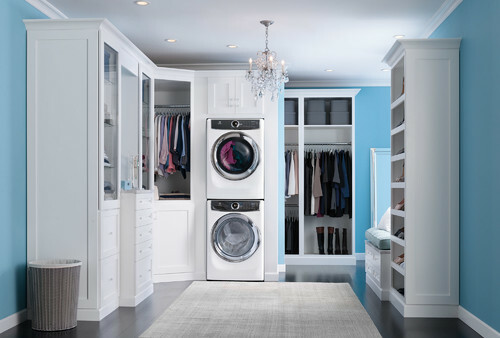 This spacious laundry would be anyone’s dream laundry. Love the waterfall surround on the washer and dryer. This room may be narrow, but the 10′ countertop more than makes up for the width. 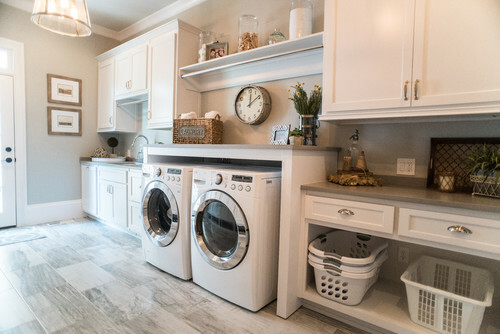 Who wouldn’t be jealous of this huge laundry room? So. Much. Storage. 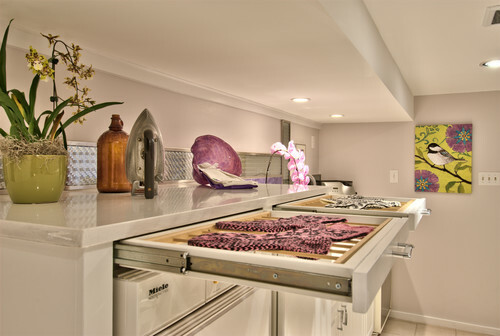 The pull-out drying rack drawers in this stunning laundry room are the bomb! Taking multitasking to a new level! 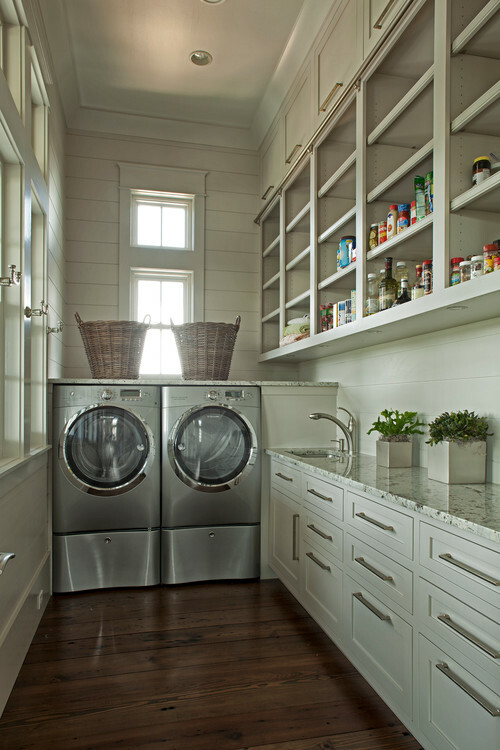 Who wouldn’t mind working in this laundry room! Nope, this isn’t a kitchen with laundry area. 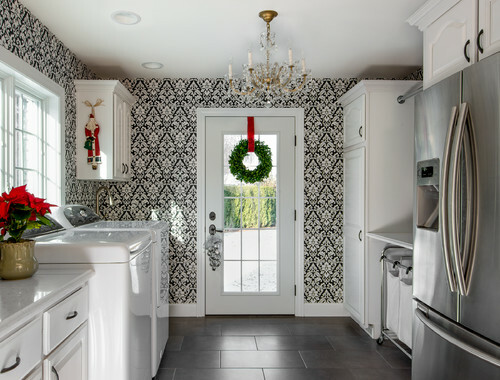 It’s a fancy laundry room/mud room with a kitchen nook! 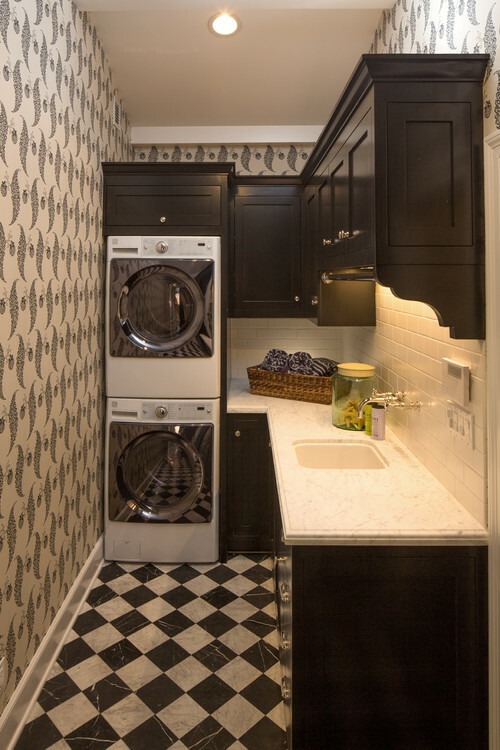 This small laundry room isn’t short on style. And there’s still plenty of space to take care of business. Even if all you have is a laundry closet, there’s no reason not to make it beautiful. The ultimate laundry room/butler’s pantry! The open shelving is so smart, making it easy to assess what you have at a glance. 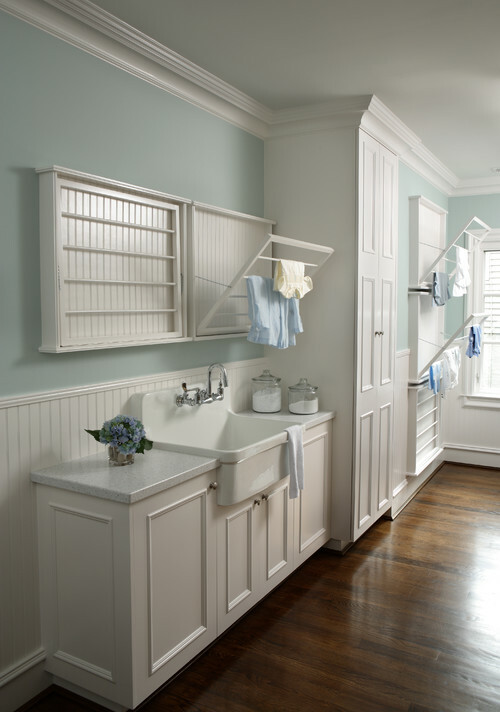 For more fabulous laundry room ideas, check out our Pinterest board! 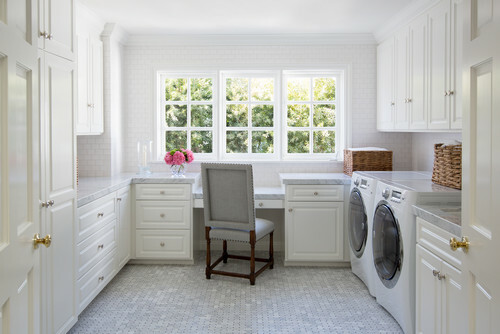 If you’re considering a laundry room remodel, you’ll want durable and easy to maintain, as well as beautiful, countertops. We invite you to stop by and browse our indoor showroom and speak to our knowledgeable staff about the best choices for your space. Homeowners, designers, architects, and contractors are all welcome!